What do you get when you mix avocado sushi, calamari salad, banana chips and a pile of cold meatballs? Nothing you'd want to eat — together. Yet all these items can be found behind the "sneeze guards" at area salad bars. Gone are the days when lettuce-loving diners found only chunks of watery iceberg and a few sliced veggies alongside goopy dressings and a cursory collection of crunchy toppings. Vermont restaurants have made a lot of produce progress. Case in point: Souza's Brazilian Steakhouse catered mainly to carnivores for five years on lower Main Street in Burlington. But at its brand-new venue up the hill, on the corner of St. Paul, there's a sizable "international" soup and salad bar. "Every rodizio steakhouse in Brazil has one," explains chef Kelly Dietrich. It seems the American salad-bar idea is so hot in Brazil that his restaurant didn't feel "authentically Brazilian" without one. Items at Souza's run the gamut from translucent slices of smoked salmon to hearty scoops of hot black beans and rice. Though more Vermont restaurants are making the greens scene, the concept is not exactly new. And the origins of the salad bar are not exactly known, either. Chuck's Steak House of Waikiki, Hawaii, claims to have invented it in 1959. Other reports indicate that Sam and Viola Cliff of Springfield, Illinois, operated one at their restaurant, called The Cliffs, in the late 1940s. The couple holds an apparent trump card — a 1950 postcard advertising their restaurant's "salad bar buffet." What culinary historians are certain of is that the modern salad-bar concept became wildly popular in the health-faddish 1970s. Even aerobics guru Richard Simmons got in on the craze, opening a combination salad bar and fitness studio mid-decade. But the café side of the establishment, which had the unfortunate name of "Ruffage," didn't last long. The foraging furor got a boost from entrepreneur Rich Melman, who co-founded a Chicago singles bar and restaurant called RJ Grunts in 1971 and quickly began converting leafy greens into greenbacks. The place still exists, one of many restaurants in Melman's Lettuce Entertain You hospitality group. Grunts, known for its hippie chic and macrobiotic leanings, proffered a 40-item, all-you-can-eat deal. It's the great-grandpa of places such as Burlington's Stone Soup and Montpelier's Rhapsody, which cater to a health-conscious, partially vegetarian crowd. Other local salad-slingers, such as the Windjammer in South Burlington and Middlebury's Fire and Ice, hew to the more popular steak/seafood/salad model. The communal, DIY aspect of the salad bar may explain its popularity, but it comes with a host of health concerns. In some respects, eating at a salad bar is like sharing a meal with dozens of strangers. Vermont restaurant inspector Al Burns doesn't advise shunning them. But he's happy to elucidate a few tenets of salad-bar safety: 1) You must use a clean plate every time you go back to a salad bar; 2) Food should be covered, or a "sneeze guard" should be in place; and 3) If food is not kept at the correct temperature — below 41 degrees for cold foods and above 135 for hot — it must be discarded after four hours. The biggest health hazard at salad bars? People sticking their fingers in the food, which happens "especially at the grocery stores," Burns suggests. That's not why we left supermarkets and co-ops out of the following salad-bar survey, though. No, chowing down at eight restaurants in five towns over five days was enough. We managed to sample nearly every ingredient — hot, cold or (inappropriately) room temp. Along the way, we swore off three-bean salad forever. And mayo is out for at least a month. Nine varieties of wimpy pasta salad will do that. Not that the dining experience was all bad, by any means. Does lettuce entertain you? Read on. Cost at dinner: $8.25 on its own, $3.99 with an entrée. Note: It was a pleasant surprise to find high-end items like mozzarella balls and zingy marinated-artichoke salad in a pub-style restaurant. Cost per pound: $6.99; sushi is sold by the piece. Notes: This hot-and-cold bar with a sushi station is the only place we found vegan options almost exclusively: Tofu mayo replaces the traditional variety. Some of the sushi includes seafood. The café's location next to the Savoy Theater is a bonus. Cost at dinner: $26.95 for salad bar, dessert bar and juice. $36.95 for an all-inclusive meal with numerous kinds of meat. Notes: Has by far the greatest number of unusual or exotic dishes. At lunch, get a salad bar/rodizio-combo for $12.95. 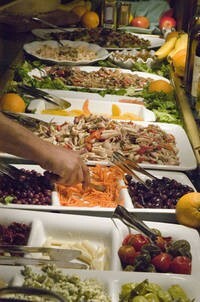 The price includes grilled meats, a dessert bar and tropical fruit juices such as mango, guava and cashew. Don't miss the cheese bread. Notes: Hot-bar items change daily. Everything is extremely fresh and flavorful, and there are many vegetarian and vegan options. Sometimes a bit of salt is needed. Sassy salads: Marinated broccoli salad*, pasta salad, three-bean salad"
Notes: No public restroom. Salad bar wasn't very well stocked by 1:30 p.m. on one visit. Sassy salads: Black bean salad*, coleslaw, farfalle vinaigrette*, fruit salad, garbanzo salad*, marinated mushrooms, pickled beets, orecchiette with chunks of cheese*, shells with mayo, three-bean salad"
Cost at dinner: $9.99 on its own. Included with many entrées. Notes: Don't miss the carrot cake or the cheese-stuffed bread as you "waltz through the salad ballroom" with a boat in the middle. Sassy salads: Beet salad*, broccoli stem salad*"
Cost: $8.99 on its own. Included with many entrées. Note: This local chain offered a couple of unusual veggies, plus excellent service and a casual environment. Sassy salads: Fruit salad, marinated mushrooms, pickled beets, spiral pasta with red pepper dressing*, three-bean salad, whole wheat penne with mayo*"
Cost at dinner: $8.99 on its own. Included with many entrées. Note: This salad boat has identical items on each side, paired with slightly different dressings. MY-T-FINE159 Route 7, Swanton, 868-4616. Closed Monday. Breakfast, lunch & dinner. SOUP 'N' GREENS325 N. Main Street, Barre, 479-9862. Open 7 days. Breakfast, lunch & dinner. SOUTH STATION AT TROLLEY SQUARE170 S. Main Street, Rutland, 775-1736. Open 7 days. Brunch, lunch & dinner. YACHT CLUB RESTAURANT AT THE COMMODORES INN823 S. Main Street, Stowe, 253-7131. Open 7 days. Breakfast & dinner.